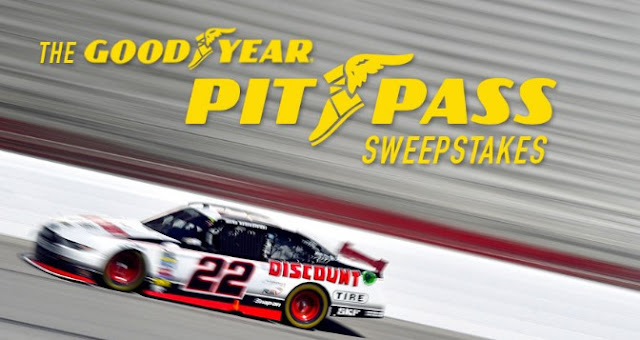 Goodyear, the official tire of NASCAR, wants you to enter to win a VIP Racing Experience at the Charlotte Motor Speedway where you'll have dinner with one and only #22, Brad Keselowski and more! GRAND PRIZE: One (1) trip for winner and guest to a VIP Race Experience October 5 – October 10, 2016. Grand Prize Package consists of: (a) Tickets for winner and one (1) guest to a NASCAR Xfinity Series Race at Charlotte Motor Speedway on October 7, 2016 and Tickets for winner and one (1) guest to NASCAR Sprint cup Series at Charlotte Motor Speedway on October 8, 2016. Charlotte Motor Speedway is located in Concord, NC; (b) round trip coach class airfare for winner and guest from a major commercial airport near winner’s residence within the U.S. to Charlotte Douglas International Airport; (c) NASCAR credentials for track experience and photo at the car with Discount Tire/American’s Tire Driver; (d) Behind the scenes shop tour of Brad Keselowski Racing prior to weekend ; (e) Private dinner with NASCAR driver Brad Keselowski; (f) Six (6) days/five (5) nights hotel accommodations (one standard room, double occupancy, room and tax only, at hotel chosen by Sponsor); (g) $500 spending money for the Winner only. Spending money will be awarded in the form of a check or gift card issued to the Winner. The approximate retail value (ARV) of Grand Prize is: $4,000. This Sweepstakes ends on 07/31/16 and you can ENTER ONCE to win.